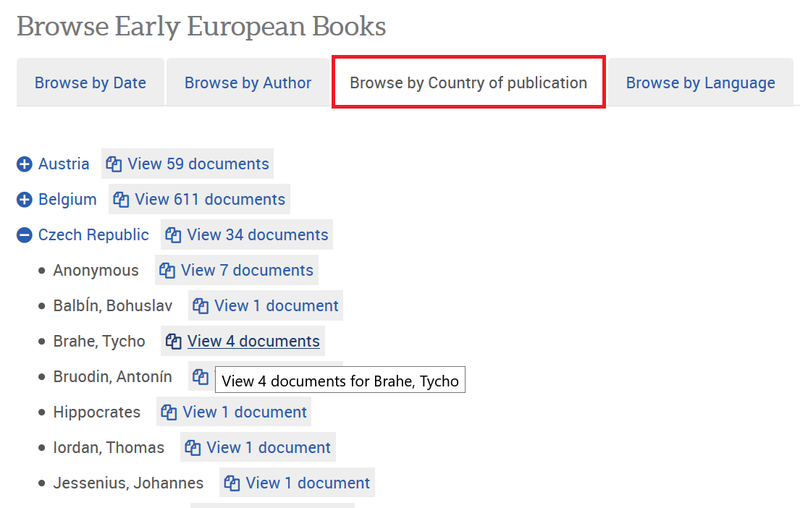 The list of the available terms per each index will change according to the Early European Books collection you have access to. Click on the link View # document(s) next to the term of interest to reveal all books by that particular Date, Author, Language or Country in the Results page. For the Author Name list: Select a letter to go down to a list of all authors whose name start with this particular letter. For the Country of Publication and the Language lists, go to the term of interest, then either click on the View # document link next to it, to see all the books by that particular Country or Language, or click on the plus sign on the left of the term to show the Author names for that country or language and the nrs of documents per each.